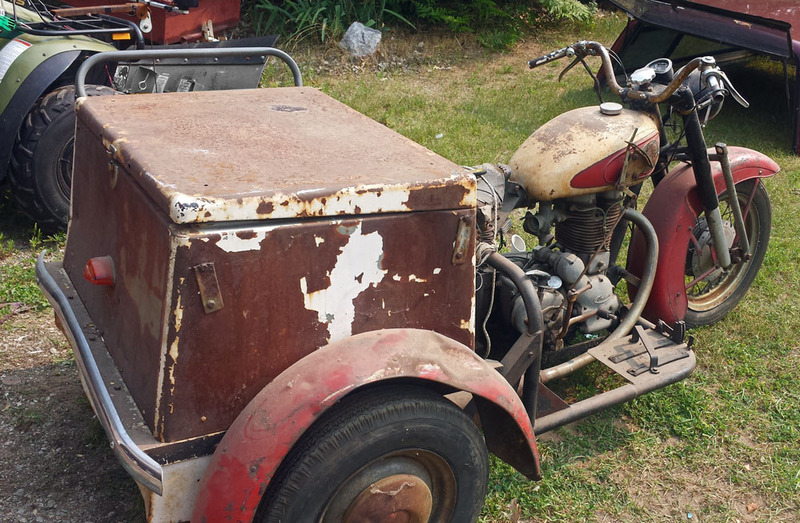 Royal Enfield engine powers this Indian three-wheeler of the 1950s. A Royal Enfield powered Indian Patrol Car for sale on eBay in Sobieski, Wis. reminds us how awesome these three-wheeled motorcycles were. Built for work, not play, they were impressive in size but still attractively styled. "This was my brother's bike," seller Eric Kurowski wrote me. "I thought you would enjoy a pic or two." "I'm not sure where my brother got it from but he had 45 years of collecting and building. Back in the '70s he dominated the Daytona bike shows with his choppers. "I enclosed a pic of my Brother Dave 'Kraut' Kurowski on his 1942 Harley Servi-Car in a Wisconsin January Winter! He rode every New year's no matter the weather." 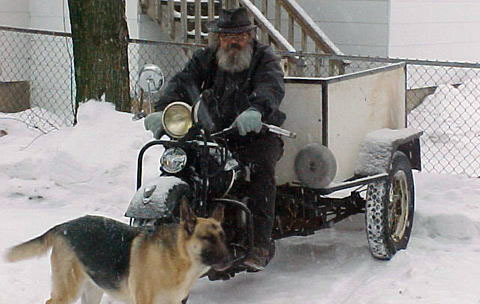 Dave "Kraut" Kurowski on his Harley Davidson Servi-Car. David H. Kurowski died April 6, 2013 at age 64. His obituary in the Green Bay Press Gazette notes that he "was an avid motorcycle enthusiast known well in the local biker community. He will be remembered for his enjoyment of racing and his mechanical expertise. Kraut won multiple awards for his many bike creations and restorations. He also loved hunting and fishing in the great outdoors. Kraut loved living on the edge with the need for speed." 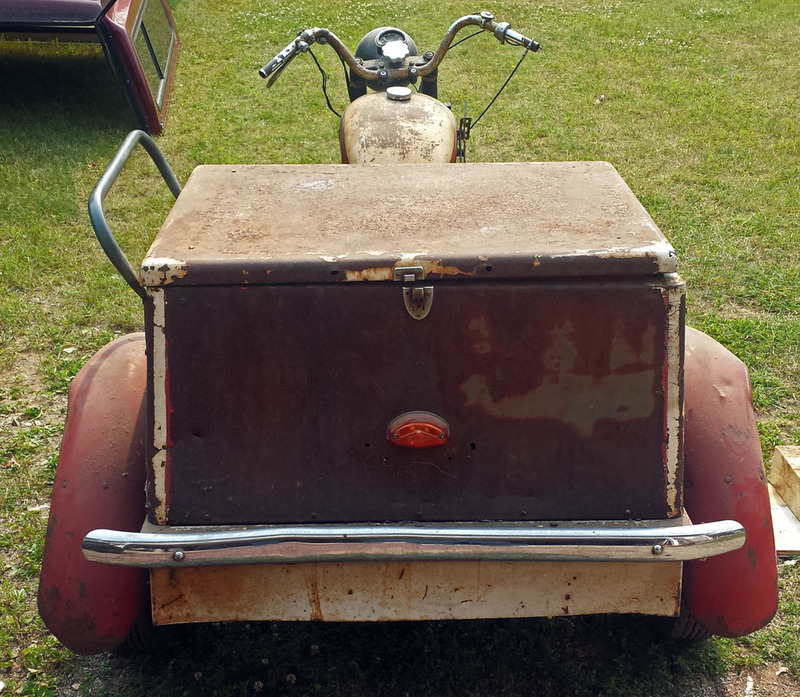 This Indian has a full box and wide floorboards. Note tank shift. "In the box was additional transmission too. I found the original suicide shift as well with the linkages to replace. The wood floor of the box is in perfect shape . There are no rust holes though the body. Just light surface rust. The original lid handles are in the box too." If the box didn't hold what you wanted to carry, you could strap more on the flat lid. Whether it's restored or even just reassembled, this Patrol Car will be the only one of its kind at the show. They're very rare, although my best attempts to muddle through the history of the Indian Patrol Cars leaves some questions unanswered. Typically these have the Royal Enfield 350 single and Albion transmission set up to give three forward speeds and reverse. There's a big handsome tank with the Indian head logo and the hand gearshift. A roomy box on the back carries supplies. Indian logo fit fine on this Royal Enfield gas tank. Wide floorboards are sometimes present to add to the appearance of a substantial motor vehicle, not just a motorcycle with two rear wheels. When Indian stopped making its own motorcycles in the early 1950s, Royal Enfields of all sorts were imported and rebadged to fill the catalog. Some of the Royal Enfield engined Indian Patrol Cars resemble the British Pashley three-wheelers of the day, which also had Royal Enfield motors. But others resemble the Patrol Cars Indian had been making when it had its own motors. Tow bar meant one man could deliver a car to a customer. Indian had offered its own Patrol Car to compete with the similar Harley Davidson Servi-Car. They were handy for police and meter maids, and if a gas station had one the mechanic could tow it behind a repaired automobile to deliver the car to the customer, then ride back to work.